This significant keychain holds a touching sentiment »My heartbeats will echo your name until I see you again«, an expression of profound longing and deep love. 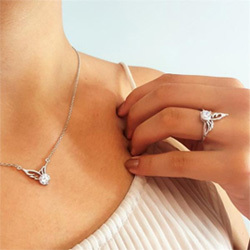 A delicate lace-patterned angel wing is added to the pendant creating that unique Linda's Stars look. It’s alittle bigger than I thought it would be but I still liked it! Beautiful piece for an Unbelievable price!!!!!! !